Watching the sunrise over the mountains through my hotel window and rolling out the media from yesterday’s photo and video shoot onto disk to make way for more material today. Successful photo shoots always start by tanking up: fish, eggs, rice, vegetables, sausages, miso, orange juice, tea and natto! I wouldn’t mind the taste of natto if it didn’t look so awful and wasn’t so damned hard to maneuver about. Kiyomizudera Temple, within walking distance of my hotel, is a natural place to start the “First Time” touring. Although, Kiyomizudera is picturesque in the Fall when the leaves turn, it’s too early in the year to catch the Fall leaves this trip. The backpack is loaded up with camera gear, batteries are charged, memory cards are empty and we’re off! Wow, that was no leisurely 25 minute walk, and it was uphill the whole way. You know your journey to a shrine or temple has come to an end when you run the gauntlet of food and souvenir vendors. I’m a sucker for this kind of stuff and found some very nice fans with ryo, usagi, tora and uma motifs. 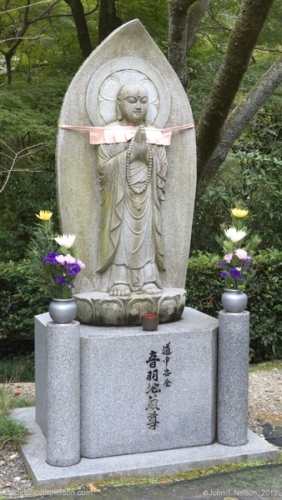 Visiting a shrine or temple can have a festival atmosphere and nowadays can be a good place to take a date. Made my way to the pagoda and entrance to the temple. Before entering the temple I stand in line waiting to ritually cleanse myself of earthly evil before I enter the place of Buddha. Offered prayers (and some coin for the offering box) and joined the rest of humanity in enjoying the view of the grounds from the temple veranda. After enjoying the view, visitors can walk along an elevated path for a good view of the veranda and temple against a blanket of Fall leaves (even though its too early in the year for anything but some Japanese Maples to turn color). Although I brought both a DSLR and video camera, I’m focusing mostly on using the video camera, its light, portable and not very intrusive. Toured the temple grounds and got some good video footage of pagodas, natural surroundings, and the Otowa waterfall, where three channels of water fall into a pond for visitors to catch and have their wishes fulfilled. Just had an amusing “conversation” with a women at the local area street map. We tried to understand each other but had difficulty getting passed the vocabulary and grammar of our respective languages. After struggling for a few minutes with the total lack of commonality in language, we laughed and said goodbye… one of the few words we did have in common. The dancing bear might not be proficient but he’s damned amusing! The neighborhood that surrounds Kiyomizudera has a few other temples and feels like a nice place to live, although not flossy. There are plenty of beautiful images to be made along the Komagawa and in the Higashiyama area of Kyoto. These hills are a killer, though, especially for the elderly which explains the parade of taxi’s running up and down Matsubara-dori. Kyoto is jam packed with taxis too, but that’s to be expected in a dense, metropolitan area with so many attractive cultural sites and tourists to photograph them. Decided to wander about the neighborhood again. Found a take-out bento box place that also serves food by the pound, deli style. I ordered the egg on beef with rice, cheap and good! Also stopped at the nearby 7-Eleven for a Match and chocolate eclair. Tested the credit card, which did not work but the more preferable debit card did work. Using a card on the Visa network is probably the most convenient and cost-effective way of getting money overseas.